It’s early August and we are on the last leg of Winter. It’s around this time that I like to prepare for our Spring / Summer garden. This preparation includes forking and aerating the soil whilst adding compost and manure to enrich it further. In addition to that, I like to start building the framework for climbing plants such as melons & legumes so that they are ready as soon as I put them to ground. 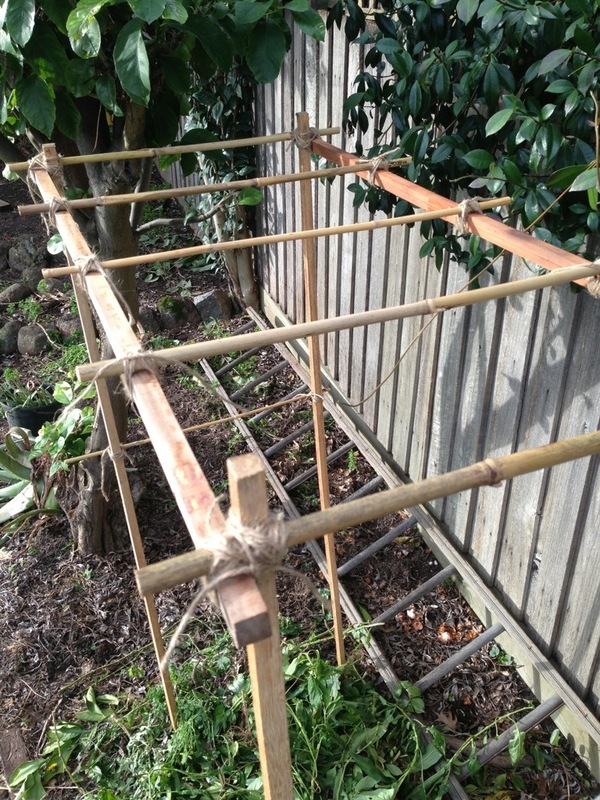 This is a simple melon frame made out of timber and bamboo garden stakes. I don’t like to spend a lot of money on buying purpose cut pieces because it can get quit expensive. I always like the idea of working with what you have and this translates into my frame building as well. 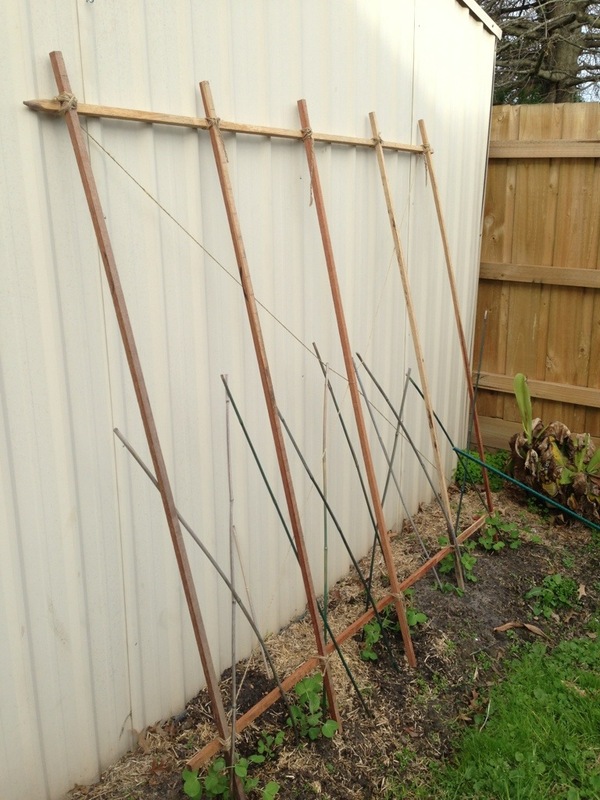 I built a ‘ladder’ type frame and tied it to four long stakes which acts as legs. I then hammer the leg stakes into the ground to secure it and make the top ‘ladder’ level on all four sides. And voila, a frame suitable for some kind of melon (we haven’t decided on which to plant yet). I will be adding more horizontal and diagonal stakes to add additional integrity to the structure, which also serves the purpose of directing any developing tendrils upwards to the top of the frame. This one below is a very simple frame made from the same timber stakes used above. 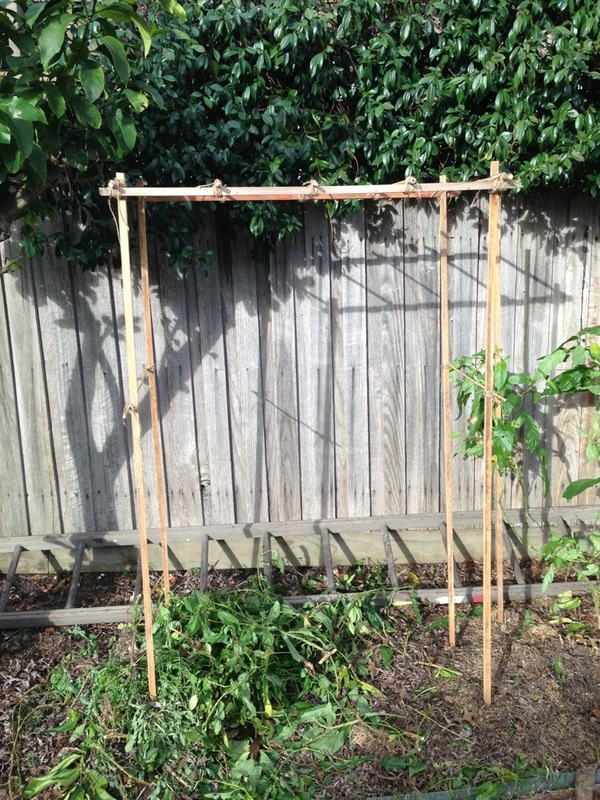 This frame is a basic ladder and is simply leaning onto our garden shed with the already pointed ends hammered in the ground. I hope that when the snow peas finally mature, they will add a beautiful green barrier to block out (in part) the very loud cream colour of the shed. Another benefit is that this will reduce the sun reflecting back into our kitchen on a hot summers day. Wow I want a garden now! !